Mol. Cells. Mar 31, 2017; 40(3): 163-168. Microglia are the primary resident immune cells of the central nervous system (CNS). They are the first line of defense of the brain’s innate immune response against infection, injury, and diseases. Microglia respond to extracellular signals and engulf unwanted neuronal debris by phagocytosis, thereby maintaining normal cellular homeostasis in the CNS. Pathological stimuli such as neuronal injury induce transformation and activation of resting microglia with ramified morphology into a motile amoeboid form and activated microglia chemotax toward lesion site. This review outlines the current research on microglial activation and chemotaxis. Microglia are the primary mediators of innate immune response in the brain to infection, injury, and diseases. Microglia are derived from primitive hematopoiesis in the fetal yolk sac and take up residence in the brain during early fetal development, and transform into mature ramified microglia either through or not through the stages of amoeboid microglia (Fig. 1A)(Prinz and Priller, 2014; Streit et al., 1988). Under physiological conditions microglia in the central nervous system (CNS) exist in the ramified state, it is also called ‘resting’ state. The resting microglia are characterized by small cell body with elaborated thin processes with multiple branches in all directions(Kreutzberg, 1996). The processes of resting microglial cells are constantly moving through its territory, and senses changes in the environment (Kettenmann and Verkhratsky, 2011; Nimmerjahn et al., 2005). When a neuronal damage is detected by microglial cells, they initiate specific programs that result in the gradual transformation of ramified microglia into ‘activated microglia’ or ‘reactive microglia’ which shows retracted processes and enlarged cell bodies (Fig. 1B). This progression is referred to as ‘microglia activation’. Microglia activation includes thickening and retraction of processes, increase in cell body size, changes in the expression of various enzymes and receptors, and secretion of cytokines (Kreutzberg, 1996; Stence et al., 2001). After pathological stimuli, activated microglia moves using amoeboid-like movements and gather around the lesion site where they undergo further transformation and become phagocytes, clearing cellular debris by phagocytosis (Kettenmann and Verkhratsky, 2011). Recent evidences indicated that microglia exhibit two functionally different activation states that are referred to as classical (proinflammatory, M1) and alternative activation (anti-inflammatory, M2). Cytokines such as Interferon γ (IFNγ), interleukin 1β (IL-1β), interleukin 12 (IL-12), and interleukin 6 (IL-6) as well as lipopolysaccharide (LPS) induce M1 phenotype and result in production and release of proinflammatory cytokines such as tumor necrosis factor-alpha (TNFα) and IL-6, matrix metal-loproteinase 9 (MMP-9), nitric oxide (NO), and reactive oxygen species (ROS)(Barcia et al., 2012; Delgado, 2003; Suzumura, 2013). 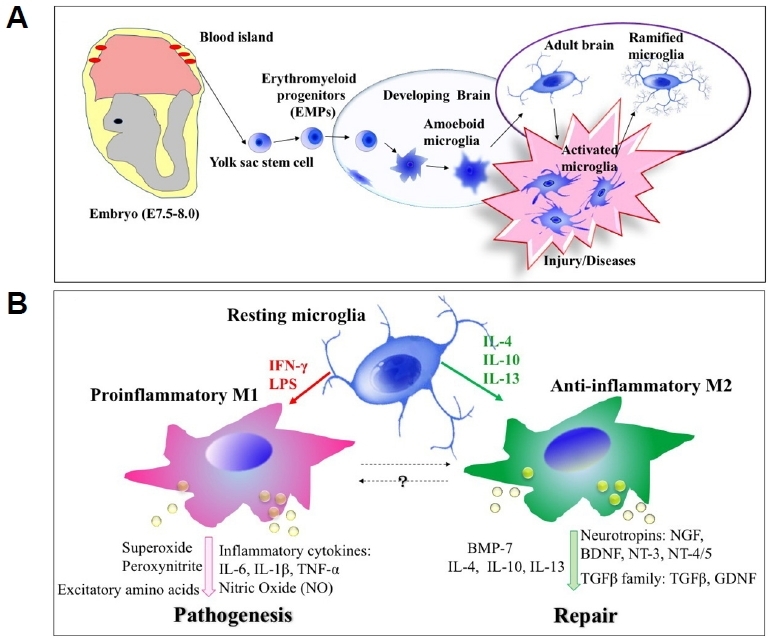 Chronic activation of microglia may cause inflammation-mediated neurotoxicity through secretion of inflammatory molecules (Block, 2014; Gordon, 2003; Streit, 2002). In contrast, M2 microglia, induced by cytokines interleukin 4 (IL-4), interleukin 13 (IL-13), interleukin 10 (IL-10) and transforming growth factor β (TGFβ), are primarily associated with tissue repair and extracellular matrix composition (Colton and Wilcock, 2010; Gordon, 2003; Town et al., 2005). To sense and respond to concentration gradients, internal signaling polarity aligned with the concentration gradient has to be established in the cell, and phosphoinositol-3-kinase (PI3K) has been known to play an essential role in establishing the polarity. Selective localization of PI3K to the leading edge membrane upon exposure to a chemoattractant gradient allows the spatially restricted production of phosphatidylinositol 3,4,5-triphosphate (PI(3,4,5)P3), which induces F-actin polymerization at the front of migrating cells (Haugh et al., 2000; Parent et al., 1998; Rickert et al., 2000). Furthermore, a positive feedback loop between PI3K and F-actin polymerization regulated by Rac GTPase has been suggested in previous studies (Wang et al., 2002; Weiner et al., 2002). Rac and F-actin mediate the location of the PI3K to the cell membrane where Ras can locally activate the PI3K and further release second messenger PI(3,4,5)P3, increasing the F-actin polymerization (Sasaki and Firtel, 2006). The spatially and mutually exclusive localization of the PI3K and PTEN phosphatase provides a mechanism to sharply regulate the membrane localization of PI(3,4,5)P3, creating a steep intracellular signaling gradient (Castellano and Downward, 2010). Activation of the PI3K pathway via ionotropic P2X receptors is also required for microglial chemotaxis in response to chemoattractant ATP. It has been shown that antagonists of P2X4R significantly inhibited PI3K activation and microglial chemotaxis (Ohsawa et al., 2007). ADP stimulation also induced PI3K activation and Protein Kinase B (Akt) phosphorylation in microglia via metabotropic P2Y12 receptor (P2Y12R) as Akt phosphorylation was inhibited by a P2Y12R antagonist (Irino et al., 2008; Lee et al., 2011). Secretion of MMPs degrading extracellular matrix is one of the hallmarks of microglia activation and plays an important role in cell migration. Induction of MMP expression has been demonstrated to be regulated by PI3K-Akt signaling cascade when microglia are stimulated by agents such as β-Amyloid or LPS (Ito et al., 2007). Thus, PI3K signaling cascade has been considered as an essential component for the regulation of cell polarity and chemotaxis. Recent evidences also point that additional pathways act in 3′-PI signaling pathway. A genetic screen in Dictyostelium to identify redundant pathways revealed that loss of calcium-independent phospholipase A2 (iPLA2) made chemotaxis become more sensitive to reductions in PI3K activity (Chen et al., 2007). Strong chemotaxis defects are observed only when both the PI3K and iPLA2 are disrupted. Likewise, pharmacological inhibition of both PI3K or PLA2 is required to prevent chemotaxis in steep cAMP gradients, suggesting that PI3K and iPLA2 are two redundant mediators of chemotaxis (van Haastert et al., 2007). Recent studies showed that reduced expression of iPLA2β or cPLA2 leads to a significant chemotaxis defects of monocytes toward monocyte chemo-attractant protein-1 (MCP-1), mainly due to the reduction of speed (Carnevale and Cathcart, 2001). iPLA2 also appeared to regulate directionality and actin polymerization during monocyte chemotaxis (Mishra et al., 2008). Recently, a study on the role of iPLA2 in regulating microglia chemotaxis showed that iPLA2 regulates PI3Kα activity via Src family kinases activation (Lee et al., 2011). Inhibition of iPLA2 with a highly selective inhibitor, bromoenol lactone, resulted in a significant reduction in the activation of the PI3K-Akt signaling which requires Src activity. It was further demonstrated that iPLA2 activity is specifically required for the trafficking of c-Src back to the plasma membrane. Additional evidence for the important role of iPLA2 in the regulation of microglia chemotaxis was from the study showing that the recycling of internalized α6 integrin vesicles and their delivery to focal adhesions also requires iPLA2 activity during microglia chemotaxis (Lee et al., 2016). Results from studies on chemotaxis of different types of cells clearly indicate that iPLA2 takes a significant part in the regulation of chemotaxis. Microglia express both ionotropic (P2X) and metabotropic (P2Y) purinergic receptors that have important roles in activation, motility or paracrine signaling of these cells (Honda et al., 2001; Inoue, 2002; Sasaki et al., 2003). In a brain with damaged neurons and astrocytes, large amounts of nucleotides (ATP and ADP) are released from these cells (Dubyak and el-Moatassim, 1993; Neary et al., 1994). The extracellular nucleotides may play a role in modulating the microglial function in the early phase of pathological conditions. Extra-cellular ATP or ADP released from damaged neurons and surrounding astrocytes serves as a chemoattractant and induces microglia chemotaxis. The increase of membrane ruffling and chemotaxis upon ADP stimulation through Gi/o-coupled P2Y12 receptor (P2Y12R) has been observed in cultured rat microglia (Davalos et al., 2005; Haynes et al., 2006; Nasu-Tada et al., 2005). 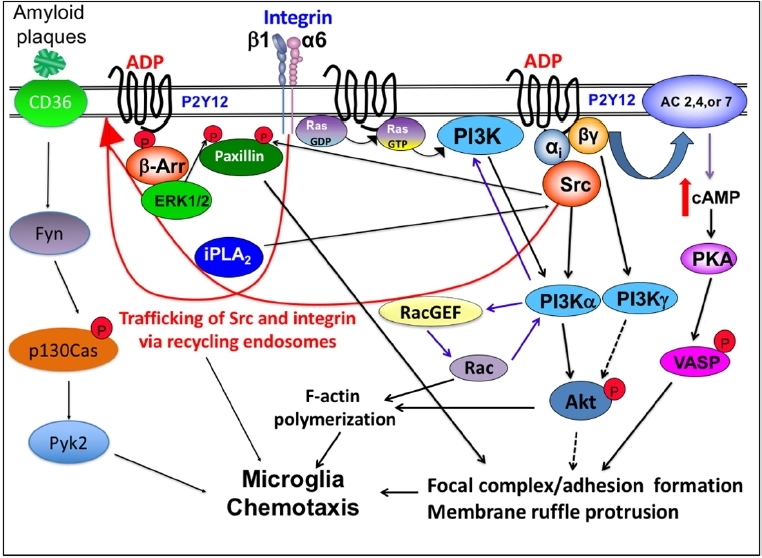 The intracellular signaling pathways evoked by the activation of P2Y12R during microglia chemotaxis are not understood well but has been under many investigations recently. Ohsawa et al. (2007) reported that membrane ruffling induced by ADP via P2Y12R is not dependent upon PI3K activation, whereas the ATP gradient-dependent cell migration requires PI3K activation. In a later study, they reported that Akt activation is dependent not only dependent on the PI3K pathway but also on a phospholipase C (PLC)-mediated increase in intracellular calcium (Irino et al., 2008). P2Y12R was reported to be linked to a potassium channel, and ATP/ADP-induced activation of P2Y12R elicits an outward potassium current in microglia (Swiatkowski et al., 2016). Blocking this current abolished chemotaxis to ATP, suggesting that this current plays an important role in the regulation of microglia motility. The role of PKA for microglia activation has been suggested as increases in TNFα mRNA resulting from LPS stimulation were reduced significantly by the neuropeptide vasoactive intestinal peptide (VIP) and the structurally related peptide pituitary adenylyl cyclase-activating polypeptide (PACAP) (Kim et al., 2000). The action of VIP is mediated by the elevation of intracellular cAMP and PKA activation as forskolin mimics the action and PKA inhibitor reverses the neuropeptide-induced inhibition. The role of PKA in the regulation of microglia chemotaxis has also been investigated. cAMP-elevating agents such as forskolin or dibutyryl cAMP were reported to inhibit ADP-induced membrane ruffling and chemotaxis, suggesting that increase of intracellular cAMP and PKA activation might have a negative effect on ADP-induced cell migration. Mechanism of this inhibition has been suggested later by Lee and Chung (2009). They reported that activation of P2Y12R by ADP stimulation caused the elevation of intracellular cAMP concentration via the activation of adenylyl cyclase (AC) by Gβγ released from Gαi. This leads to the activation of PKA and prolonged phosphorylation on Ser153 of vasodilator-stimulated phosphoprotein (VASP) by PKA causes impaired focal adhesion formation/maturation and ruffle formation, resulting in chemotaxis defects. Association of VASP with focal adhesions and areas of dynamic membrane activity suggest that VASP plays a pivotal role in actin filament assembly and cell motility. The regulation of phosphorylation and dephosphorylation on VASP might be required for the membrane ruffle formation and growth of adhesion strength during membrane protrusion and retraction, exerting a direct impact on cell’s ability to chemotaxis (Lee and Chung, 2009). It has been reported that ADP stimulation via P2Y12R induces the translocation of β1 and α6 integrins to the membrane ruffle regions (Lee et al., 2016; Nasu-Tada et al., 2005). Redistribution of β1 was lost when the intracellular cAMP was increased, suggesting that PKA is a negative regulator of the β1 integrin translocation, resulting in a significant impact on microglia chemotaxis (Nasu-Tada et al., 2005). Extracellular signal–regulated kinases (ERKs) or classical MAP kinases are known to play important roles in the signaling pathways that regulate microglia activation and chemotaxis. The increase in the phosphorylation of ERK and p38 MAPK in response to LPS has been reported (Wang et al., 2011) and elevated activity of ERK1/2 resulted in increased expression of proinflammatory cytokines. Stimulation of microglia with stromal cell-derived factor-1 (SDF-1) via CXC chemokine receptor 4 (CXCR4) induces microglia activation and IL-6 production through PI3K and ERK signaling pathways (Lu et al., 2009). P2Y12R has been shown to be involved in the microglia activation as antagonists of the P2Y12/P2Y13 receptor had inhibitory effects on the morphological changes of microglia associated with activation such as retraction of processes (Haynes et al., 2006; Tatsumi et al., 2015). Elevated activity of ERK1/2 via P2Y12R has also been reported in ADP-stimulated platelets (Shankar et al., 2006) and this activation could be blocked by either forskolin or analogs of cyclic AMP, indicating a crosstalk between ERK1/2 and PKA (Zhang et al., 2016). The mechanism of ERK1/2 activation from P2Y12R upon ADP stimulation in microglia was unclear until recently. Lee et al. (2012) revealed a mechanism by showing that activation of ERK1/2 is dependent upon β-arrestin recruitment to P2Y12R. They also showed that activation of ERK1/2 has a significant impact on chemotaxis by causing an increase in the phosphorylation of Ser83 of paxillin (a major component of focal adhesion) that is required for adhesion disassembly during chemotaxis (Lee et al., 2012). Thus, change in ERK1/2 activity has a direct impact on chemotaxis through the regulation of focal adhesion dynamics. Src family kinases are non-receptor tyrosine kinases, and elevated Src activity is suggested to be linked to cancer progression and many other cellular activities including chemo-taxis. CD36 on the microglia cell surface have been implicated in the innate immune response and chemotaxis of microglia to β-amyloid (Stuart et al., 2007). Binding of β-amyloid to CD36 activates Fyn, a Src family kinase, which phosphorylates a scaffolding protein, p130Cas. p130Cas then acts as a scaffold to recruit proline-rich tyrosine kinase 2 (Pyk2) and paxillin, and assembly of this complex is essential for microglia migration. Translocation of the p130Cas complex to the membrane ruffles and the leading edge also coincide with the F-actin polymerization, indicating β-amyloid-induced CD36 signaling might also regulate the F-actin polymerization and cell migration. It has been demonstrated that c-Src activity is increased upon ADP stimulation via P2Y12R and enhanced c-Src activity is required for PI3K activation upon ADP stimulation (Lee et al., 2011). In a later study, c-Src was shown to be required for the phosphorylation of paxillin at Tyr31, which is essential for focal adhesion assembly and microglia chemotaxis (Lee et al., 2012). Hyper-activation of microglia may cause neuronal damage through the exaggerated secretion of potentially inflammatory molecules. Pathological activation and chemotaxis of microglia have been reported in several neurological diseases such as Alzheimer’s disease. Therefore, understanding of microglia function may be essential for designing rational approaches for therapeutic modulation of neuroinflammation and a better understanding of microglia proliferation and chemotaxis may have important therapeutic implications for neurodegenerative diseases. Mol. Cells.Mar 31, 2017; 40(3): 163-168. Received January 24, 2017; Accepted March 7, 2017. Barcia, C., Ros, C.M., Annese, V., Gomez, A., Ros-Bernal, F., Aguado-Llera, D., Martinez-Pagan, M.E., de Pablos, V., Fernandez-Villalba, E., and Herrero, M.T. (2012). IFN-gamma signaling, with the synergistic contribution of TNF-alpha, mediates cell specific microglial and astroglial activation in experimental models of Parkinson’s disease. Cell Death Dis. 3, e379. Block, M.L. (2014). Neuroinflammation: modulating mighty microglia. Nat Chem Biol. 10, 988-989. Carnevale, K.A., and Cathcart, M.K. (2001). Calcium-independent phospholipase A(2) is required for human monocyte chemotaxis to monocyte chemoattractant protein 1. J Immunol. 167, 3414-3421. Castellano, E., and Downward, J. (2010). Role of RAS in the regulation of PI 3-kinase. Curr Top Microbiol Immunol. 346, 143-169. Chen, L., Iijima, M., Tang, M., Landree, M.A., Huang, Y.E., Xiong, Y., Iglesias, P.A., and Devreotes, P.N. (2007). PLA2 and PI3K/PTEN pathways act in parallel to mediate chemotaxis. Dev Cell. 12, 603-614. Colton, C., and Wilcock, D.M. (2010). Assessing activation states in microglia. CNS Neurol Disord Drug Targets. 9, 174-191. Davalos, D., Grutzendler, J., Yang, G., Kim, J.V., Zuo, Y., Jung, S., Littman, D.R., Dustin, M.L., and Gan, W.B. (2005). ATP mediates rapid microglial response to local brain injury in vivo. Nat Neurosci. 8, 752-758. Delgado, M. (2003). Inhibition of interferon (IFN) gamma-induced Jak-STAT1 activation in microglia by vasoactive intestinal peptide: inhibitory effect on CD40, IFN-induced protein-10, and inducible nitric-oxide synthase expression. J Biol Chem. 278, 27620-27629. Dubyak, G.R., and el-Moatassim, C. (1993). Signal transduction via P2-purinergic receptors for extracellular ATP and other nucleotides. Am J Physiol. 265, C577-606. Gordon, S. (2003). Alternative activation of macrophages. Nat Rev Immunol. 3, 23-35. Haugh, J.M., Codazzi, F., Teruel, M., and Meyer, T. (2000). Spatial sensing in fibroblasts mediated by 3′ phosphoinositides. J Cell Biol. 151, 1269-1280. Haynes, S.E., Hollopeter, G., Yang, G., Kurpius, D., Dailey, M.E., Gan, W.B., and Julius, D. (2006). The P2Y12 receptor regulates microglial activation by extracellular nucleotides. Nat Neurosci. 9, 1512-1519. Honda, S., Sasaki, Y., Ohsawa, K., Imai, Y., Nakamura, Y., Inoue, K., and Kohsaka, S. (2001). Extracellular ATP or ADP induce chemotaxis of cultured microglia through Gi/o-coupled P2Y receptors. J Neurosci. 21, 1975-1982. Inoue, K. (2002). Microglial activation by purines and pyrimidines. Glia. 40, 156-163. Irino, Y., Nakamura, Y., Inoue, K., Kohsaka, S., and Ohsawa, K. (2008). Akt activation is involved in P2Y12 receptor-mediated chemotaxis of microglia. J Neurosci Res. 86, 1511-1519. Ito, S., Kimura, K., Haneda, M., Ishida, Y., Sawada, M., and Isobe, K. (2007). Induction of matrix metalloproteinases (MMP3, MMP12 and MMP13) expression in the microglia by amyloid-beta stimulation via the PI3K/Akt pathway. Exp Gerontol. 42, 532-537. Kettenmann, H., and Verkhratsky, A. (2011). [Neuroglia--living nerve glue]. Fortschr Neurol Psychiatr. 79, 588-597. Kim, W.K., Kan, Y., Ganea, D., Hart, R.P., Gozes, I., and Jonakait, G.M. (2000). Vasoactive intestinal peptide and pituitary adenylyl cyclase-activating polypeptide inhibit tumor necrosis factor-alpha production in injured spinal cord and in activated microglia via a cAMP-dependent pathway. J Neurosci. 20, 3622-3630. Kreutzberg, G.W. (1996). Microglia: a sensor for pathological events in the CNS. Trends Neurosci. 19, 312-318. Lee, S., and Chung, C.Y. (2009). Role of VASP phosphorylation for the regulation of microglia chemotaxis via the regulation of focal adhesion formation/maturation. Mol Cell Neurosci. 42, 382-390. Lee, S.H., Schneider, C., Higdon, A.N., Darley-Usmar, V.M., and Chung, C.Y. (2011). Role of iPLA(2) in the regulation of Src trafficking and microglia chemotaxis. Traffic. 12, 878-889. Lee, S.H., Hollingsworth, R., Kwon, H.Y., Lee, N., and Chung, C.Y. (2012). beta-arrestin 2-dependent activation of ERK1/2 is required for ADP-induced paxillin phosphorylation at Ser(83) and microglia chemotaxis. Glia. 60, 1366-1377. Lee, S.H., Sud, N., Lee, N., Subramaniyam, S., and Chung, C.Y. (2016). Regulation of Integrin alpha6 Recycling by Calcium-independent Phospholipase A2 (iPLA2) to Promote Microglia Chemotaxis on Laminin. J Biol Chem. 291, 23645-23653. Lu, D.Y., Tang, C.H., Yeh, W.L., Wong, K.L., Lin, C.P., Chen, Y.H., Lai, C.H., Chen, Y.F., Leung, Y.M., and Fu, W.M. (2009). SDF-1alpha up-regulates interleukin-6 through CXCR4, PI3K/Akt, ERK, and NF-kappaB-dependent pathway in microglia. Eur J Pharmacol. 613, 146-154. Mishra, R.S., Carnevale, K.A., and Cathcart, M.K. (2008). iPLA2beta: front and center in human monocyte chemotaxis to MCP-1. J Exp Med. 205, 347-359. Nasu-Tada, K., Koizumi, S., and Inoue, K. (2005). Involvement of beta1 integrin in microglial chemotaxis and proliferation on fibronectin: different regulations by ADP through PKA. Glia. 52, 98-107. Neary, J.T., Baker, L., Jorgensen, S.L., and Norenberg, M.D. (1994). Extracellular ATP induces stellation and increases glial fibrillary acidic protein content and DNA synthesis in primary astrocyte cultures. Acta Neuropathol. 87, 8-13. Nimmerjahn, A., Kirchhoff, F., and Helmchen, F. (2005). Resting microglial cells are highly dynamic surveillants of brain parenchyma in vivo. Science. 308, 1314-1318. Ohsawa, K., Irino, Y., Nakamura, Y., Akazawa, C., Inoue, K., and Kohsaka, S. (2007). Involvement of P2X4 and P2Y12 receptors in ATP-induced microglial chemotaxis. Glia. 55, 604-616. Parent, C.A., Blacklock, B.J., Froehlich, W.M., Murphy, D.B., and Devreotes, P.N. (1998). G protein signaling events are activated at the leading edge of chemotactic cells. Cell. 95, 81-91. Prinz, M., and Priller, J. (2014). Microglia and brain macrophages in the molecular age: from origin to neuropsychiatric disease. Nat Rev Neurosci. 15, 300-312. Rickert, P., Weiner, O.D., Wang, F., Bourne, H.R., and Servant, G. (2000). Leukocytes navigate by compass: roles of PI3Kgamma and its lipid products. Trends Cell Biol. 10, 466-473. Sasaki, A.T., and Firtel, R.A. (2006). Regulation of chemotaxis by the orchestrated activation of Ras, PI3K, and TOR. Eur J Cell Biol. 85, 873-895. Sasaki, Y., Hoshi, M., Akazawa, C., Nakamura, Y., Tsuzuki, H., Inoue, K., and Kohsaka, S. (2003). Selective expression of Gi/o-coupled ATP receptor P2Y12 in microglia in rat brain. Glia. 44, 242-250. Shankar, H., Garcia, A., Prabhakar, J., Kim, S., and Kunapuli, S.P. (2006). P2Y12 receptor-mediated potentiation of thrombin-induced thromboxane A2 generation in platelets occurs through regulation of Erk1/2 activation. J Thromb Haemost. 4, 638-647. Stence, N., Waite, M., and Dailey, M.E. (2001). Dynamics of microglial activation: a confocal time-lapse analysis in hippocampal slices. Glia. 33, 256-266. Streit, W.J. (2002). Microglia as neuroprotective, immunocompetent cells of the CNS. Glia. 40, 133-139. Streit, W.J., Graeber, M.B., and Kreutzberg, G.W. (1988). Functional plasticity of microglia: a review. Glia. 1, 301-307. Stuart, L.M., Bell, S.A., Stewart, C.R., Silver, J.M., Richard, J., Goss, J.L., Tseng, A.A., Zhang, A., El Khoury, J.B., and Moore, K.J. (2007). CD36 signals to the actin cytoskeleton and regulates microglial migration via a p130Cas complex. J Biol Chem. 282, 27392-27401. Suzumura, A. (2013). [Microglia in pathophysiology of neuroimmunological disorders]. Nihon Rinsho. 71, 801-806. Swiatkowski, P., Murugan, M., Eyo, U.B., Wang, Y., Rangaraju, S., Oh, S.B., and Wu, L.J. (2016). Activation of microglial P2Y12 receptor is required for outward potassium currents in response to neuronal injury. Neuroscience. 318, 22-33. Tatsumi, E., Yamanaka, H., Kobayashi, K., Yagi, H., Sakagami, M., and Noguchi, K. (2015). RhoA/ROCK pathway mediates p38 MAPK activation and morphological changes downstream of P2Y12/13 receptors in spinal microglia in neuropathic pain. Glia. 63, 216-228. Town, T., Nikolic, V., and Tan, J. (2005). The microglial “activation” continuum: from innate to adaptive responses. J Neuroinflammation. 2, 24.
van Haastert, P.J., Keizer-Gunnink, I., and Kortholt, A. (2007). Essential role of PI3-kinase and phospholipase A2 in Dictyostelium discoideum chemotaxis. J Cell Biol. 177, 809-816. Wang, F., Herzmark, P., Weiner, O.D., Srinivasan, S., Servant, G., and Bourne, H.R. (2002). Lipid products of PI(3)Ks maintain persistent cell polarity and directed motility in neutrophils. Nat Cell Biol. 4, 513-518. Wang, Y.P., Wu, Y., Li, L.Y., Zheng, J., Liu, R.G., Zhou, J.P., Yuan, S.Y., Shang, Y., and Yao, S.L. (2011). Aspirin-triggered lipoxin A4 attenuates LPS-induced pro-inflammatory responses by inhibiting activation of NF-kappaB and MAPKs in BV-2 microglial cells. J Neuroinflammation. 8, 95. Weiner, O.D., Neilsen, P.O., Prestwich, G.D., Kirschner, M.W., Cantley, L.C., and Bourne, H.R. (2002). A PtdInsP(3)- and Rho GTPase-mediated positive feedback loop regulates neutrophil polarity. Nat Cell Biol. 4, 509-513. Zhang, X., Qin, J., Zou, J., Lv, Z., Tan, B., Shi, J., Zhao, Y., Ren, H., Liu, M., and Qian, M. (2016). Extracellular ADP facilitates monocyte recruitment in bacterial infection via ERK signaling. Cell Mol Immunol. , .